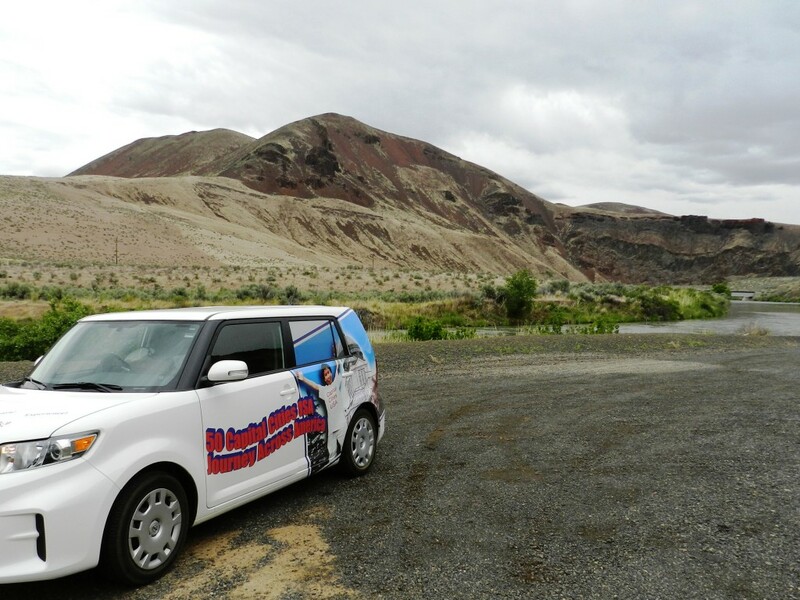 Capital Cities USA Journey Across America | Shut The Front Door! Linda Burton traveling from Boise, Idaho to Bend, Oregon on the way to Salem, Oregon – “Shut the front door!” or some version thereof is what I repeated each time I rounded another curve. The scenery was unexpected. According to the map, once I crossed the Snake River from Idaho into Oregon and left the freeway for Highway 20, there wasn’t much. First Vale, a small agricultural town, then what looked to be a curvy road to Burns, and Harney Basin. It was that unassuming curvy road that gave me the “wows” – a juicy-fruit of changing scenes, each one a surprise. All I could say was “Shut the front door!” Just outside Vale a lonely mass in a freshly plowed field commanded my attention. I stopped to read the sign. 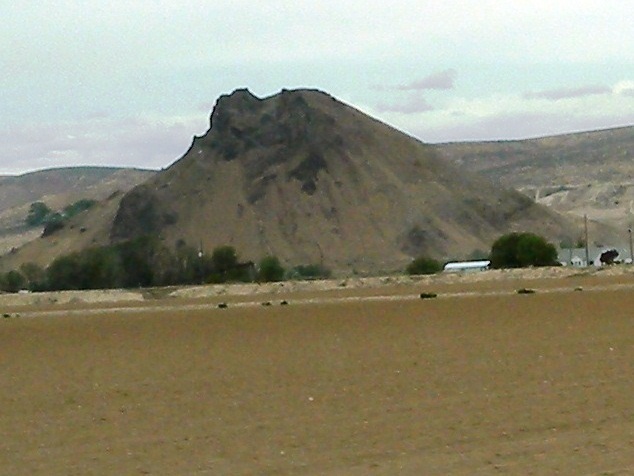 “Mahleur Butte,” it said, a leftover from the Idaho Lake of 2 million years ago. “Mahleur,” derived from the French “misfortune.” Turns out I’d see that name again and again. Unlike the pioneers, I had a paved road in my wilderness. A nicely striped and marked paved road, with the Malheur River running right beside, sometimes on my right, sometimes on my left; a brilliant mirror, moving fast. According to my map, it begins in the southern Blue Mountains, south of Strawberry Mountain (9,038) and flows through Malheur National Forest, past Drewsey, through Warm Springs Reservoir. At Riverside it receives its South Fork. 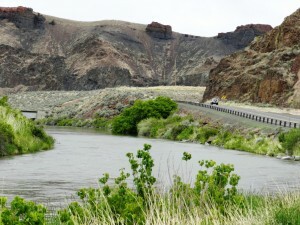 The South Fork comes from the Steens Mountain area, near Mahleur Cave, Mahleur Lake, Mahleur National Wildlife Refuge. I see Diamond Craters on the map, and the Pete French Round Barn State Heritage Site. Names that made me crave exploring time, but alas I had too many miles to go. The North Fork of the river comes through the Mahleur National Forest past Lookout Mountain (8,033), crosses the Mountain/Pacific Time Zone near Beulah, and joins the main branch near Juntura. 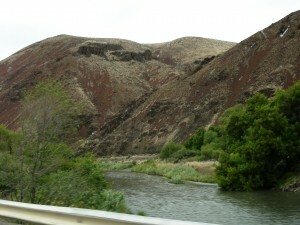 A designated National Scenic River flowing north, south, and east, the Mahleur eventually joins the Snake about two miles north of Ontario, Oregon. A circuitous route to the Pacific! Yet it wasn’t the river so much as the hills that kept me boggled, and I can’t find a name attached to any of them. 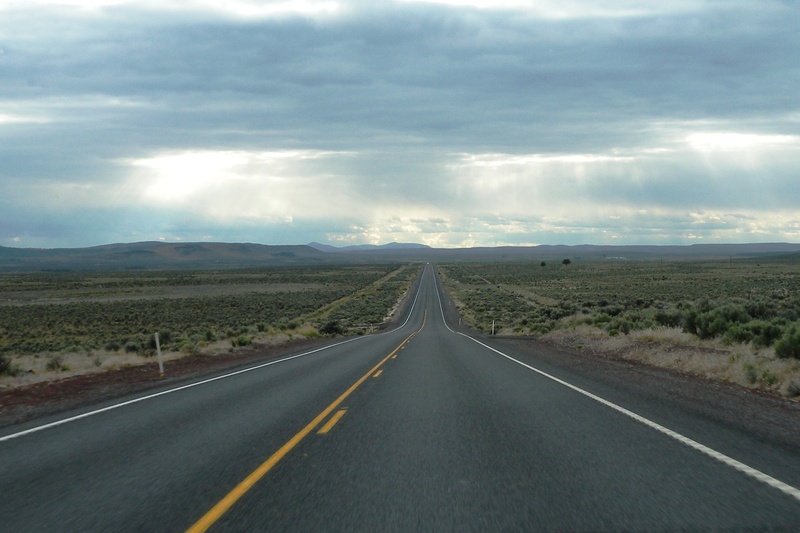 The only signs I saw on this lonely-but-gorgeous road were when I crossed Drinkwater Pass (4,212); when I entered the Pacific Time Zone; when I passed the Bureau of Land Management Wild Horse Corral; and when I stopped riverside to read an Oregon historical marker. 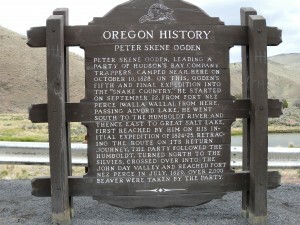 “Peter Skene Ogden,” it read. He and a party of Hudson Bay Company (HBC) trappers camped here in 1828 and took about 2,000 beaver. That was my first clue into the “misfortune” of the river. French Canadian fur trappers. Back in 1818 they cached some beaver furs near the river when working for the North West Company (NWC) on the expedition of Donald Mackenzie. The furs were (reputedly) discovered and stolen by the Indians; yet another story says they were unsuccessful in finding furs and were attacked by Indians. Pick your legend; unfortunate, either way. 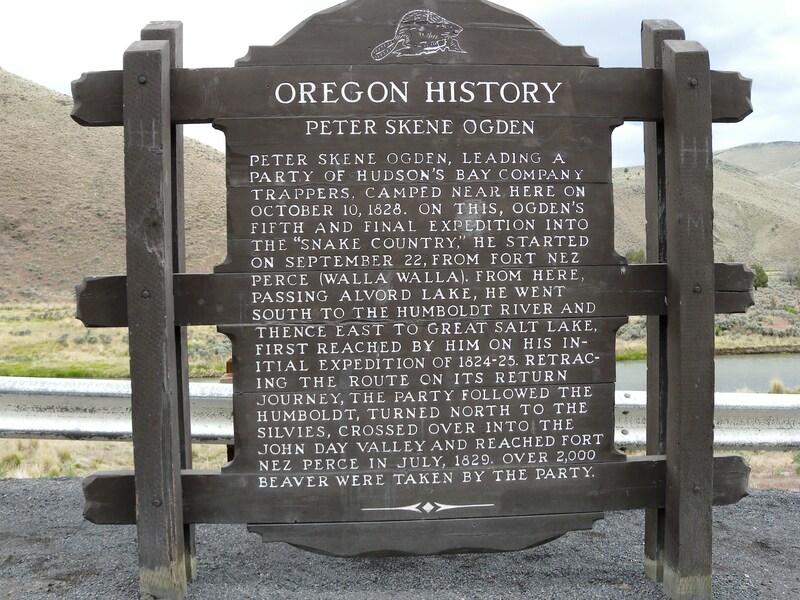 Peter Skene Ogden wrote about it in 1826, calling it the “River au Malheur” or “unfortunate river.” The HBC and NWC were highly competitive businesses, exploring and making a profit off the resources of the land. Beaver fur was a valuable commodity due to the fashion of the times – it was used to make felt hats. The HBC and NWC eventually merged; felt hats were eventually replaced by silk hats; the demand for beaver fur declined. The amount of beaver declined too. After Drinkwater Pass, Harney Basin and Burns, I sailed straight across the valley; no curves, just space; just air and clouds and land, as far as I could see. My room was ready when I got to Bend; I fed the cats and sat down with the map, pondering that curvy Mahleur River road; the route used by trappers and traders so long ago. Maybe their phrase for what happened to them along that beautiful river was “unfortunate.” Or was it the beaver that suffered the misfortune? Shut the front door! Appropriate back then, too.